I had a chance to fastly test the latest Mac OSX 10.4 aka Tiger. Apple introduced some really cool features that was emerging in panther and seems now mature in Tiger. One of these features is MIDI networking! On previous OSX versions, we could view a basic network device in AudioMidiSetup. But does it ever really worked? On tiger, there is a full network configuration window allowing to create Network sessions, connecting multiple computers together to build a shared MIDI network. I did not got a chance to test is yet, because the bad news is that it seems that my beloved StealthPort (a nice serial-port adapter from GeeThree allowing to use serial MIDI interfaces) is no longer available in Tiger. The current installer refuse to install the driver. Geethree, any plans for Tiger? Please keep us informed. 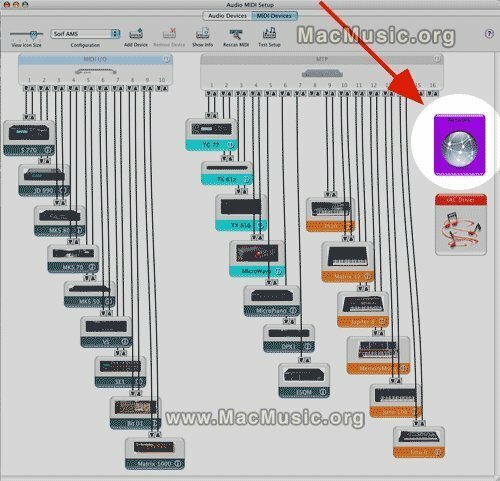 "You can use the MIDI network driver to send and receive MIDI information between computers over a network. For example, if you have a music studio with several computers connected to MIDI interfaces, keyboards, synthesizers and such, you can use the MIDI network driver to route the data from these devices to and from your computers over an Ethernet network. Normally, you might need to purchase MIDI interfaces for your devices and connect the devices with cables. With the MIDI network driver, you can have a central computer act as a "master" sending and receiving MIDI data over the network to other computers and their connected MIDI devices. To set up MIDI networking on your computer, you first create a "session." A session identifies your computer as a central location for MIDI streaming over the network. From a directory of computers on your network, you choose the computers you want to participate in the session. You can also add addresses of computers not on your local network. Once identified, these computers in the directory can send and receive MIDI information from your computer and its MIDI devices. Each computer listed in the directory becomes a "participant" in the session. When setting up a session on your computer, you specify the computer port that the network information will use, a session name, and your computer's name that will appear to other computers on the network. You can also set up specific routings of MIDI devices. For example, you might specify that a MIDI keyboard connected to another computer route its MIDI data to a synthesizer connected to your computer." I'm really excited by this MIDI network feature if there is a near to zero latency between computers locally connected thru gigabit ethernet : This would allow amazing possibilities to interconnect multiple computers, allowing for example to dedicate a mac as a big virtual instrument receptor and another one as an audio sequencer. Or to have a Protools for audio on one computer synchronised with a Logic for MIDI on another computer. And what about to connect to windows computers too ? I you had a chance to test MIDI networks or if you've got more informations, please add your comments below.